Here are some Arum seedheads. Arum maculatum is a common woodland plant species of the Araceae family. It is widespread across most of Europe as well as Turkey and Caucasus. It is known by an abundance of common names including snakeshead, adder's root, arum, wild arum, arum lily, lords-and-ladies, devils and angels, cows and bulls, cuckoo-pint, Adam and Eve, bobbins, naked boys, starch-root, wake robin, friar's cowl and jack in the pulpit. The name "lords-and-ladies" and other gender related names refer to the plant's likeness to male and female genitalia symbolising copulation. 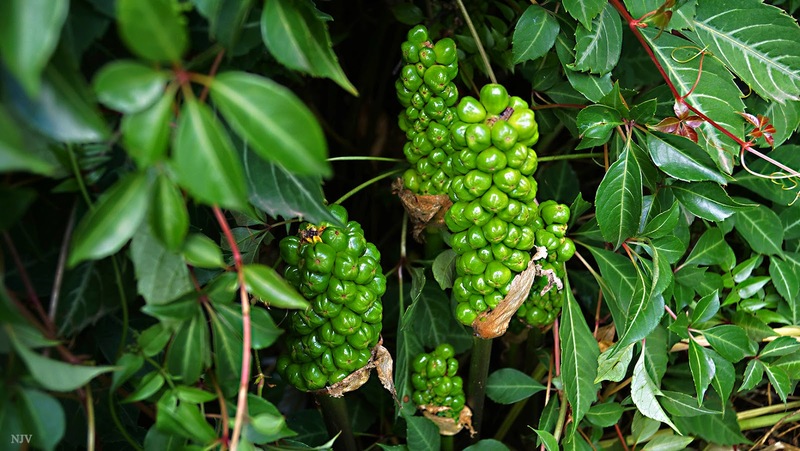 In Summer, the lower ring of (female) flowers deep in the spadix of the inflorescence form a cluster of green berries, which in Autumn turn bright red. These remain after the spathe and other leaves have withered away. These attractive red to orange berries are extremely poisonous! Incredible range of names for one plant. The berry clusters look like a skinny green pineapples. A beautiful photo and a gorgeous green. it is natural of course that so wonderful berries are toxic above all if they shine then later pink or red! An especially fine photo of the immature berries! I never took a photo of these green berries, only when they changed their colour to red, what a pitty. Your photo looks so beautiful. hiya Nick, I'm enjoying the green meme. Have been planning to do this for years. the leaves in the top right hand corner of your picture, is that Parthenocissus henryana? Was this taken in your garden? BTW, are you involved with the Aus Open? Do you go to see them? In Germany we only know this plant as "Aronstab". There are no other names, I think. It is very spectacular. Nice shot! I can see why you needed a new, green, meme. Neato!